I have never thought of making Instant upma mix & Podi recipes at home until Sendhil travelled to Norway for an official trip last year. Usually he used to take store bought instant noodles, ready to eat upma mix, pongal mix, paruppu podi/Dal powder, Vathakuzhambu paste from Sakthi masala, Aachi or MTR products. Last year, when he travelled abroad, my friend Shalini suggested me to make Instant upma mix, poha mix and Poondu podi on my own as she used to make it for her husband’s travel regularly and she guaranteed more shelf life even though they are homemade & prepared without any preservatives. I made everything as per her recipes and packed them for Sendhil and his colleagues. For this upma mix, I referred Radha mam's blog too. Sendhil told the instant mix was very useful for making quick breakfast and late night dinner after coming home tired from the office, everything tasted great and all his friends liked it too .I was elated and thanked my friend Shalini for giving me confidence to try instant mix recipes at home. Actually he suggested me to blog this recipe long back. But somehow I kept postponing it . This weekend, I have planned to make a post on “Cooking tips for working women”. Before that, I wanted to blog few recipes related to that post. This upma mix can help bachelors, working women and busy mothers with kids or to treat your surprise guests at home to make quick breakfast or dinner.If you can spare some time on Sunday to make this mix, it will help you to make your food easily without hassles whenever you feel lazy to cook. All you need to do is just boil some water, add 1 cup of mix and cook for few minutes.Tadaaa, Hot hot Rava upma is ready to enjoy . We usually like to have it sugar or coconut chutney as side dish and sometimes with leftover lunch sambar too. You can follow the same recipe and make this mix with Wheat rava, Poha and vermicelli. 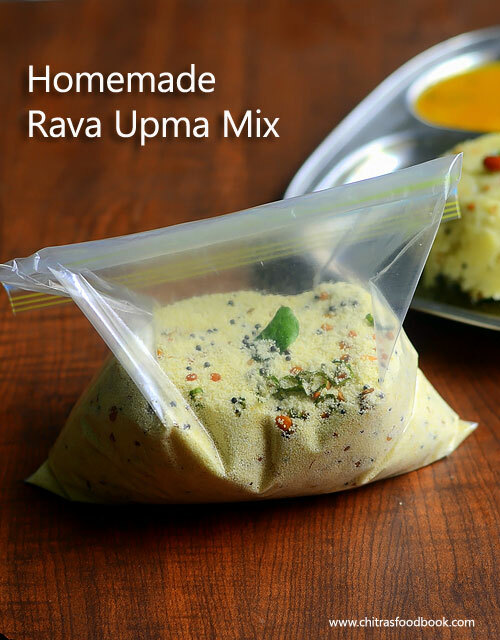 This rava upma mix can be used to make Rava idli , mixed vegetable rava khichdi and Rava dosa as well. I have given the recipes for the same below. Check it out. 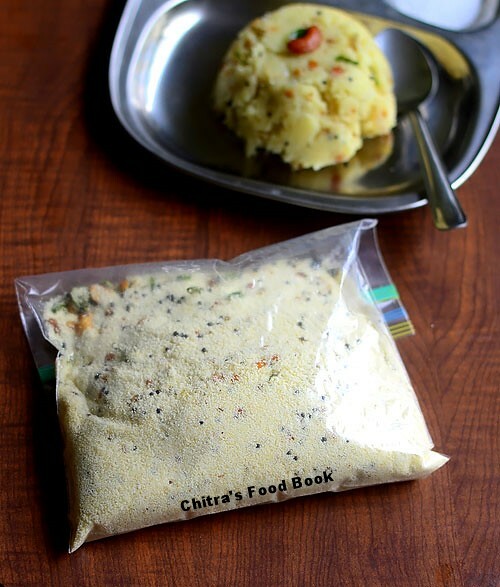 Lets see how to make this easy, readymade upma mix at home. Heat oil or ghee ( ghee would be better) in a kadai and splutter mustard seeds, urad dal, chana dal and cashew nuts. Saute until dal & cashew starts to turn golden. Take care & roast it properly.Keep the flame low to medium till you roast. Add the finely chopped green chillies, ginger and curry leaves. Saute well till the dals turn golden color completely. Make sure no dals are burnt. So . Remove the roasted items in a plate. In the same kadai, roast the rava for 5-6 minutes in medium flame. Keep mixing and roast the rava properly. Its raw smell should go off. Switch off the flame and let the rava be in the same kadai. Now take the roasted dal mixture, required salt and mix with the roasted rava. Let the mixture cool down completely. Store it in an air tight box or ziplock cover and refrigerate it. It stays good for months. Note : My friend Shalini told me to add finely chopped onions too along with chillies & ginger. She told upma mix will stay good for weeks if onion is well sauteed. You can try it if you wish. Boil 2.5 cups of water and when the water comes to roll boil, simmer the flame completely and add 1 cup of upma mix. Mix well without lumps and check for taste. Add salt if needed.Cover & cook the upma for 2-3 minutes. Open the lid, mix well and again cover cook for another 2 minutes. Lastly add 1 tbsp of coconut oil. Do not forget it. 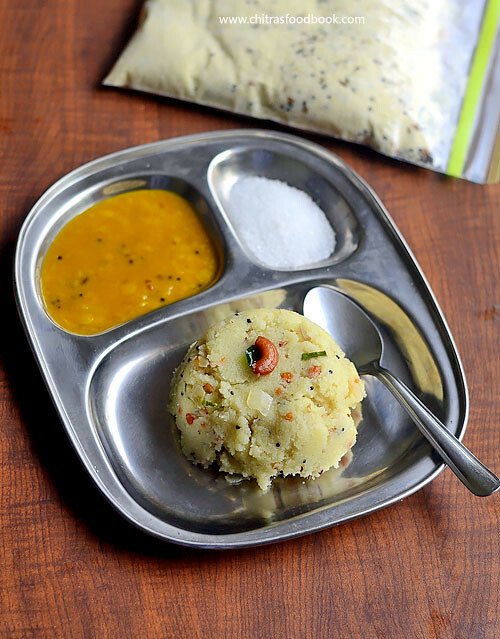 Fluff the upma and serve hot with chutney or sugar. Check out my Rava upma post too. Boil 4 cups of water, add finely chopped carrot, potato and peas( if using). Add turmeric powder and let the veggies cook for few minutes. After the veggies are half done, add the upma mix. Mix well and pressure cook the khichdi in low flame for one whistle. Refer my Rava khichdi post. Take 1 cup of mix, add rice flour, maida, crushed pepper corns and required water, salt. Mix well and check for taste. Refer my Rava dosa recipe for more details. Take 1 cup of mix. Add 1 cup of curd, some water, few drops of lemon juice and 1 tsp of eno fruit salt. Mix well and steam it. Here is my Rava Idli post for reference. Adjust the quantity of green chilli as per your preference. Add more cashews or dals as u like. Roast the rava properly to increase the shelf life of this mix. Adding ghee for tempering gives a nice flavor for the upma while it cooks. You can use any odorless cooking oil too. Do not forget to store the rava properly and refrigerate it. Use a clean spoon to handle. 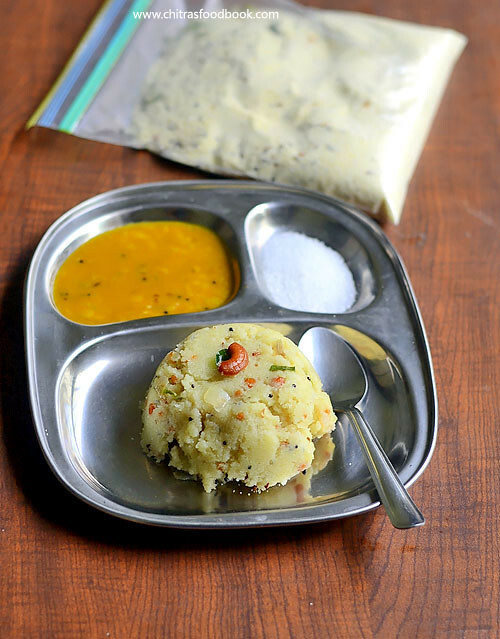 Make this upma mix at home and have a quick breakfast/dinner !! You are really wonderful chitra.. Keep posting this type of food for helping working women like us.. Thankyou.. Thank you so much Chitra. Made the mix over the last weekend - had an amazing breakfast today. Thank you so much :) Happy to know it. Hi you don't have to refrigerate it. Just store in an airtight​ box or ziplock bag. Very useful post, along with a great recipe without compromises on taste and quality. Just wanted to know how long it will keep well *without* refrigeration. Thanks! 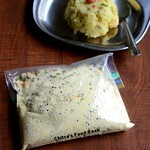 You can store for 2 weeks without refrigeration.But roast the dal well. Awesome idea. When do you add the onion and vegetable for the upma? Can I replace the coconut oil with ghee in the end? For adding in upma, we should saute the finely chopped onion and Vegetables in oil first. Add water to cook them. Once it's done, we can add the mix and cook it. Yes you can use ghee instead of coconut oil. It will be more flavorful. We can add it while making upma or kichadi. This is a common mix for upma,kichadi, rava dosa and rava idli. For adding in upma, we can saute the finely chopped onion and Vegetables in oil first.Add water to cook them. Once it's done, we can add the mix and cook it. We make this every time when we go with our kids for our vacation and you can also make this with fried vermicelli too.